Tc-ki, tc-ki, a whipcrack opening, immediately launching into beat- and bass-heavy funk, flourishes of wah-wah, and Ian Brown’s disembodied voice. You have to move at least one part of your body. There was nothing like this before: no wonder The Stone Roses shook things up with their arrogant ability. Hello Fools Gold [sic], the anti-drugs drugs anthem. Metaphors of a tired goldrush man, hoping for the big win. A long road, aching pains, going down, sinking, hoping for a change that won’t come. Cheery stuff, eh? Yet the tune is so catchy, so repeatable. And that repetition induces déjà vu, as if you are tired and hearing things, lost and going over the same ground; you’re part of the story. But you’re not really going round in circles. The story just progresses at its own pace. The official video is a microcosm of the scene at the time. Loose-limbed band members walking in an exotic location (Lanzarote), floppy fringes everywhere, trippy editing, no fitted clothes in sight, Ian Brown doing Bez-like dances. Not far off their performance of the song in 1989 on Top of the Pops – the same episode when the Happy Mondays performed Hallelujah. That broadcast put Manchester into the living rooms of the nation. The Stone Roses were a notorious band. Fallouts, legal battles, graffiti, awkward media interviews, tantrums (don’t ever shout “Amateurs!” or mention The Late Show near Ian Brown). Did I say arrogant? Ian told NME that The Stone Roses were “the most important group in the world”, a conceited tone that we’ll see was adopted by Oasis later on. The purist’s lineup for The Stone Roses is: Brown, Squire, Mani, Reni. But the band members changed as people came and went, not always harmoniously. Maybe it’s relevant that Fools Gold was inspired by the film The Treasure Of The Sierra Madre, where friends ascended Mexican mountains together looking for gold but became suspicious, greedy, and fell out with each other just when they hit the big time. This song (never included on their studio albums) was their most famous. Not fool’s gold but pure gold. 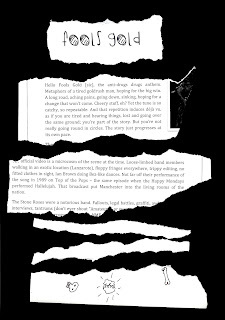 Extract from page 185 of 2000 Tunes: A History of Manchester Music by M. H. Rees; used with permission. Read the whole series (25 extracts) here; or my summary post. Readers might be interested in my forthcoming novel about a man obsessed with Manchester music - confusingly, it is also called 2000 Tunes!